Catch elusive target 19, The Blackmailer, before he gets away. Elusive Target number 19 is officially live in Hitman but The Blackmailer will only be available to try and take out for the next 10 days. The Blackmailer will be doing his thing, and therefore players will be trying to do their thing using the Paris map. 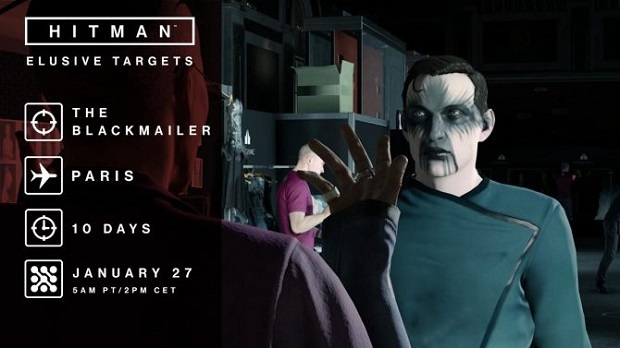 The elusive target went live on Friday morning, right about the same time Hitman developers revealed the third bonus episode that will be included in the game. This episode is called Landslide and it will take players back to Sapienza. For this episode, the target is a man named Marco, who is a “snake-tongued wealthy businessman-turned-politician who is returning to his hometown to run for mayor.” Landslide is going live on January 31 alongside an update to the base game that will see a brand new difficulty included in the title. Those who have purchased the full first season will be able to get this new mission for free.